Taipei, Dec. 12 (CNA) Former White House Chief of Staff Reince Priebus will speak in Taipei on Wednesday at an annual dialogue on security involving Taiwan, the United States, Japan and their Asia-Pacific partners, the Ministry of Foreign Affairs (MOFA) announced Tuesday. Priebus will deliver a keynote speech at the luncheon for Wednesday's ROC (Taiwan)-U.S.-Japan Trilateral Security Dialogue, according to a MOFA statement. Priebus served as President Donald Trump's chief of staff from Jan. 20, 2017 to July 31, 2017 and was also chairman of the Republican National Committee (RNC) from 2011 to 2017. When Priebus was appointed chief of staff in January, Foreign Minister David Lee (李大維) said he has visited Taiwan several times, including in 2015 and during the Republic of China's centenary celebrations in 2011. He also met with a delegation of Taiwanese lawmakers who visited the U.S. in July 2016, Lee said at the time, also noting that Priebus has maintained good relations with the Taipei Economic and Cultural Representative Office in the U.S. The annual ROC (Taiwan)-U.S.-Japan Trilateral Security Dialogue is co-organized by the MOFA, in cooperation with the Taipei-based Prospect Foundation, the U.S.-based Heritage Foundation and the Japan-based Sasakawa Peace Foundation. Some of the key themes of the discussion will be common strategic interests in the Asia-Pacific, changing security dynamics and Taiwan's strategic value; and prospects for non-traditional security cooperation, the MOFA said. Continuing a tradition, the agenda will also include a three-party dialogue between lawmakers from Taiwan, the U.S. and Japan, the MOFA said. 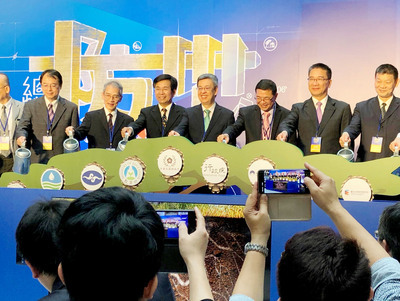 Participants will include Taiwanese legislators Chiang Chi-chen (江啟臣) and Lo Chih-cheng (羅致政), Japanese lawmakers Keisuke Suzuki and Rui Matsukawa, and former U.S. congressman Tom Petri, according to the ministry. The annual event was first launched in 2011 to promote three-way cooperation, the MOFA statement said.